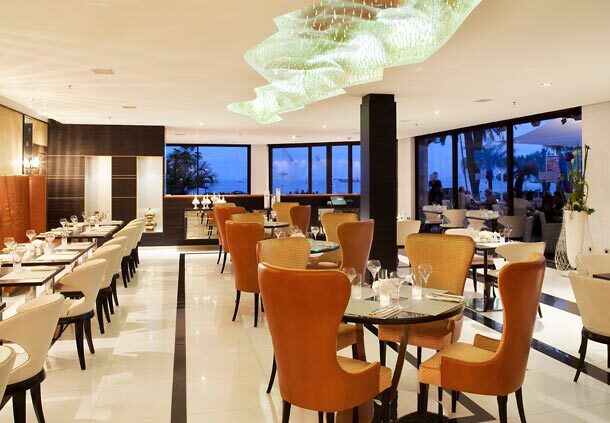 As one of the most renowned restaurants in Cannes, the hotel’s JW Grill Cannes routinely impresses guests with its steakhouse cuisine of top-quality American beef, succulent seafood and fresh salads. CANNES, FRANCE--(Marketwired - Nov 20, 2014) - In the South of France, the only thing more important to a celebration than good food is good wine. And this New Year's Eve, the JW Marriott Cannes is making sure its guests have plenty of both. As one of the most renowned restaurants in Cannes, the hotel's JW Grill Cannes routinely impresses guests with its steakhouse cuisine of top-quality American beef, succulent seafood and fresh salads. But on New Year's Eve, the restaurant is giving visitors a taste of the possibilities of fine dining in Cannes. At once inventive and classic, the New Year's Eve menu draws on the best of French traditions while featuring an exciting range of surprises. Guests arriving at the event will discover a festive atmosphere with live music and a glass of Champagne ready to welcome them. Against this lively backdrop, they can settle into their seats and begin the three-course meal with their choice of either a confection-inspired foie gras, which is served with an apple-caramel sauce, or the shellfish bouillabaisse. Both selections honor the hotel's geography in distinct ways, from the traditional French favorite of foie gras (albeit served with a candy-like twist), to the seafood soup that nods to the ocean just beyond the hotel's doors. After the starter, visitors can choose for their main course either a filet of sole rolled in mushroom paste and served with pumpkin risotto, or roasted venison loin served with parsnip chips, chestnut cream and a berry-and-pepper sauce. The same careful composition appears in the dessert options. Guests who favor savory bites can opt for a selection of artisan cheeses, while those who prefer something sweet may tuck into either a chocolate-hazelnut mousse or bite-size pastries. Throughout the meal, patrons will enjoy complimentary wines, mineral water and coffee. Such beautifully crafted dishes resonate with the property at large. Just as the New Year's Eve meal encompasses a blend of regional influences, cutting-edge ideas and traditional components, this 5-star hotel in Cannes indulges its guests with luxuriously-appointed rooms, state-of-the-art event space and a location that affords access to the legendary beaches and equally legendary celebrities. To experience the 2015 New Year's Eve dinner, visitors are encouraged to call 00 33 (0)4 92 99 70 92 or email jwgrillcannes@marriott.com. The event is EUR210 per person, all inclusive. Enviably situated on the former site of the Palais des Festivals just steps from the sparkling beach, the JW Marriott Cannes provides the perfect welcome to a renowned city. Guests can work and play at this 5-star luxury hotel with ease, thanks to features like the rooftop swimming pool and terrace, three dining venues and more than 26,000 square feet of event space that includes 16 newly renovated conference rooms and a 820-person auditorium. Guest rooms and suites further distinguish the property from other Cannes hotels on La Croisette with balconies that capture beachfront views, luxury bedding, LCD televisions and high-speed Internet access, all of which ensure a stay that is as productive as it is glamorous.